Join us, be a heart saver! 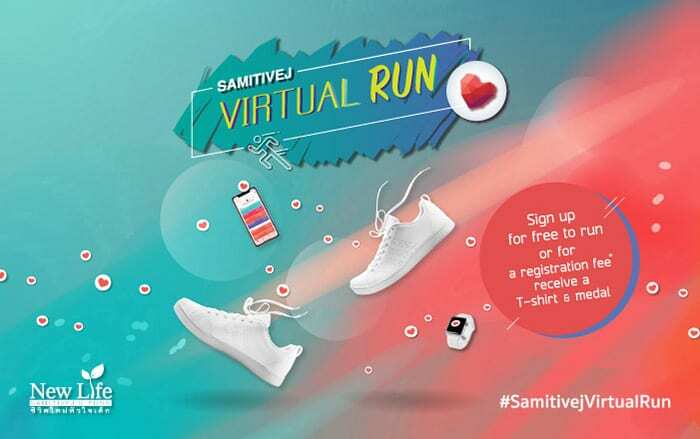 Samitivej Virtual Run is a chance for all runners to come together and run for the “Samitivej New Life Fund”. The fund has been set up to provide heart surgery for infant patients lacking the financial resources to pay for the procedures. 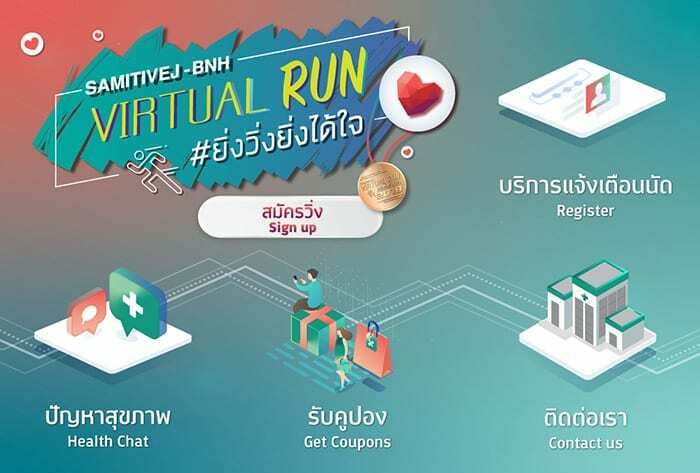 Samitivej Virtual Run will exchange every 100,000 kilometers the community runs for one heart surgery. Our aim is to provide all 12 heart surgeries. We would therefore like to invite you all to come together and run to give these children a new lease of life – and at the same improve your own fitness. Accumulate your running distance from February 14 – May 31, 2019. 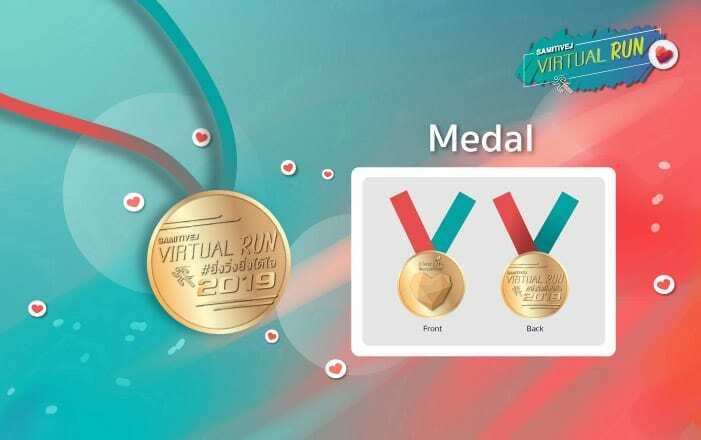 Our “Virtual Run” allows you to contribute every run, anywhere, anytime. 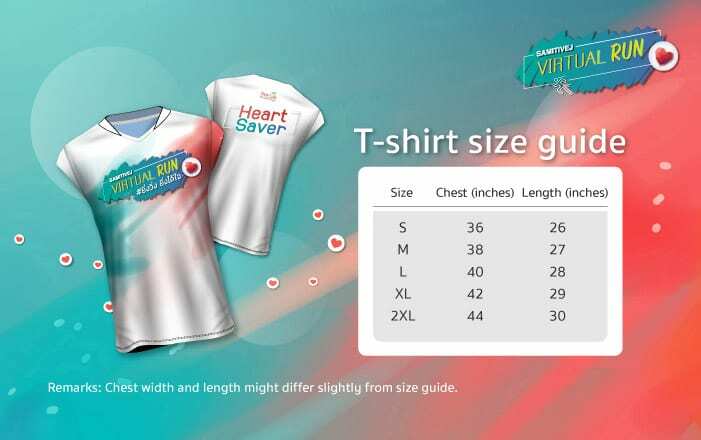 – You receive a commemorative T-shirt, medal, e-Bib and e-Certificate. 30 lucky runners can win a free VO2max fitness test (value 4,000 THB). – Transfer ฿450 with a shipping fee of ฿70 for 1 runner, ฿90 for 2 runners and ฿120 for 3 runners. Shipping to same postal address for up to 3 runners. 3. Fill in your shipping address (only if you have registered via a donation). 4. Click “add applicant to the same address” and input your personal information, including T-shirt size. You can also select the type of registration at this stage, followed by clicking “record information”. – For applicants who wish to run alone, please select “no team”. – For applicants who wish to run as a team, please select the name of the team you would like to join. 5. Once registration is complete, you receive a confirmation email with your e-Bib. 1. 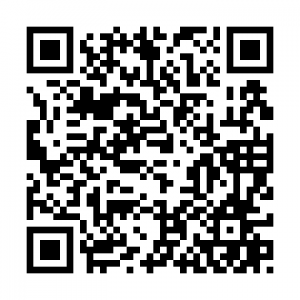 Click “Sign up” in the Samitivej Virtual Run menu on the official @Samitivej Line account. 2. Click “Log in” and type in your e-Bib number. 3. Click “Send proof of payment”. 4. Attach bank transfer slip. 5. Applicants will receive an email confirmation once payment has been verified. On @Samitivej Line account, click “Submit running distance” in the Samitivej Virtual Run menu to record and track your running distance. You can also see runners who have accumulated the highest daily distances throughout the event’s duration. No more than 3 runs can be submitted per day. Only runs from that day may be submitted. No runs from previous days can be submitted. Where the distances covered do not conform to the event’s rules and regulations, the running distance for that day will be reset to 0 (zero).